Since our daughter is expecting a baby in August (our first grandchild) I thought I’d compare baby products from 1962 with those of today. 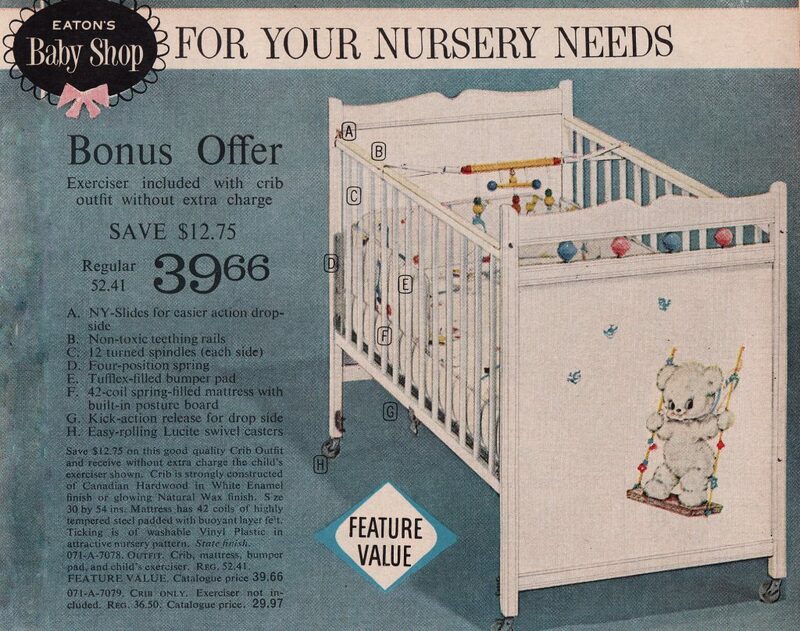 The 1962 Eaton’s Spring and Summer Catalogue has fifteen pages of items for baby. Styles and most notably, safety in design, has changed significantly since then. Many of the products for sale back then were surprisingly flimsy. 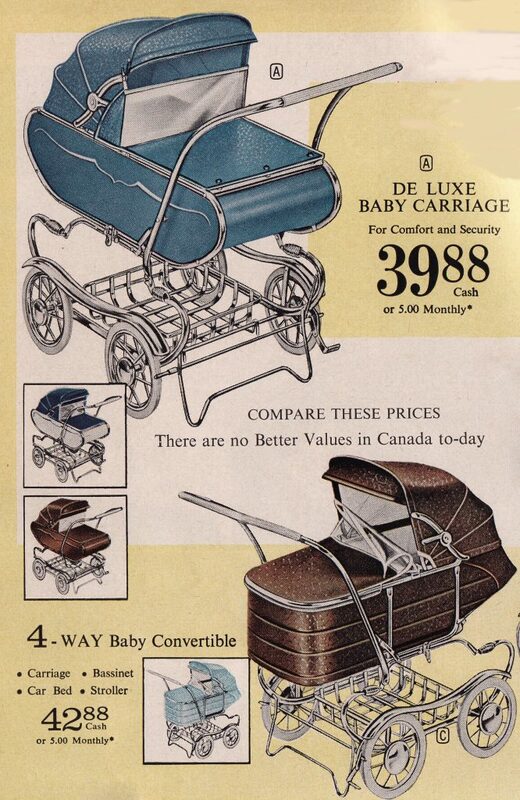 Many of the baby products from 1962 would, in fact, be illegal now. The catalogue index has just over a column of products under the title Baby Needs. Everything from absorbent cotton to walkers. Today we’ll cover high chairs, cribs, strollers and car seats. Consider the high chair below. It swivels and cost $17.97 back then. Today that would be $145.18. That was the most expensive one. Other models sold for as little as $9.29 or $74.97. Today Sears has high chairs ranging from $59.99 to $399.99. The trend seems to be to more expensive chairs. Cribs are another necessity. The featured crib in 1962 was the white number shown below. At $39.66, this would set you back $320.05 in today’s dollar. 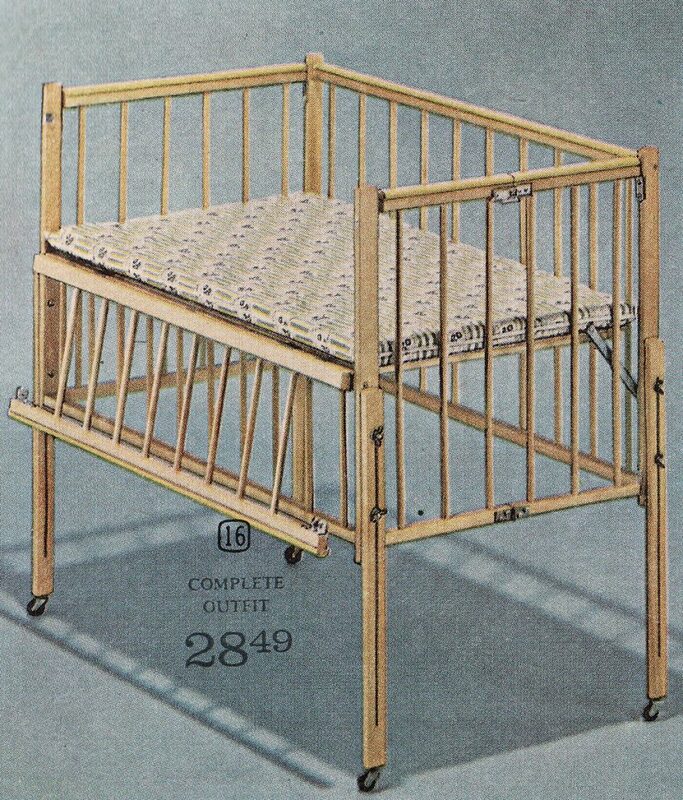 This crib lacks all the safety design features mandated by law in today’s cribs and would not be available. Today in Canada you are legally prohibited from selling some older models, even second hand, if they fail to meet today’s safety standards. The portable crib shown above would be a definite no-no today. Way too flimsy. Today’s cribs are better constructed and range from $199.99 to $749.99 at Sears. At the Bay they range from $269.99 to $719.99. Baby buggies are another important item which can set a new parent back a bundle. The two below are typical of the style back then. At $39.88 and $42.88, these would be $321.83 and $346.04 in 2016 dollars. There was one as low as $29.77 and as high as $54.88. And strollers ranged from $9.97 to $44.97 for a double model for twins. That’s $80.45 to $362.91 in today’s dollar. The equivalent in 2016 dollars for these two strollers would be $160.43 and $201.43. 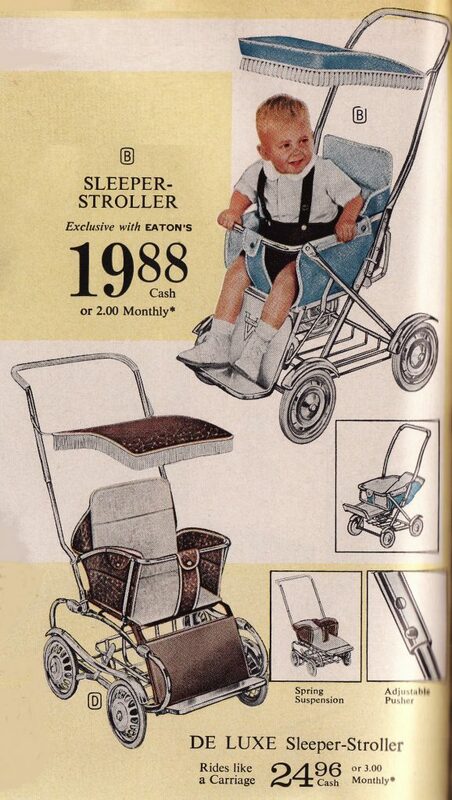 Today you’ll find strollers at Sears from $39.99 to $599.99. At the Bay they run from $229.99 to $899.99. 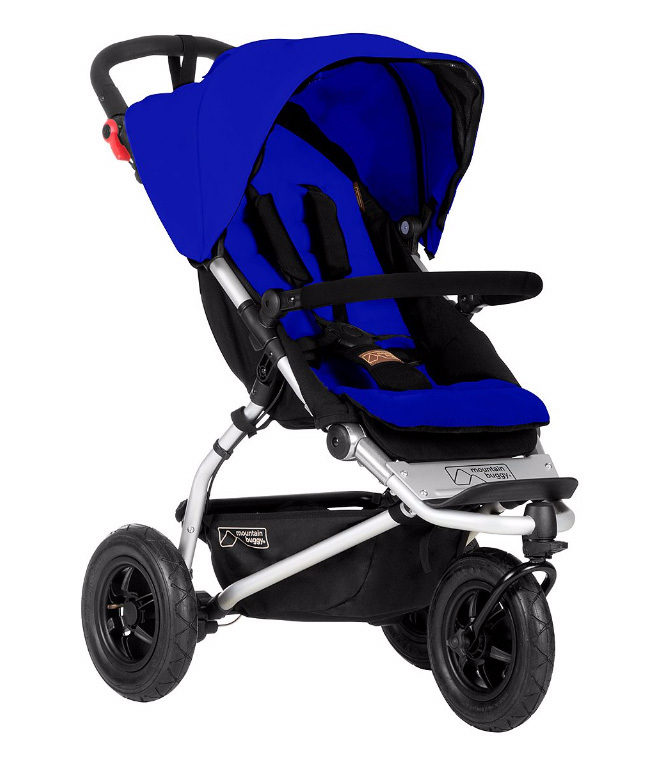 Many of today’s strollers are rather hi-tech with three wheels, a main frame that can be detached to use as a bassinet, quality brakes and more. But as with cribs, you’ll find a much wider variety at baby specialty stores, many of which lean towards the high end of things. Shops such as Babies ‘r’ Us or Baby Gap as well as many independents. Modern style baby stroller from Mountain Buggy®. This model sells for $449.99 at Sears. We finish off with something that was optional back in 1962 and mandatory today – the infant car seat. Here, perhaps, we’ll find the largest change in safety and design. The flimsy car seat K is almost laughable by today’s standards. Two metal hooks attach the seat to the car. But it does have a little horn so the little tyke can have hours of travelling fun! At $6.97, today it would be $56.25. The bassinet car seats L and M are $12.88 and $14.96 respectively or $112.06 and $ 120.73 in today’s dollar. But somehow, I don’t think baby would truly be safe in one of these. They were designed to conveniently convey a bay in a car but not to keep her safe in an accident. Today’s focus is on safety above all else and car seats are carefully engineered and hi-tech. And they are often coordinated with a buggy. The baby seating area is detached from the buggy to form a car seat. And they are fairly expensive. At Sears they range from $194.99 to $569.99 for rear-facing models (considered safer than front-facing models). The Bay has them from $189.99 to $729.99. In both cases the more expensive ones are convertible to a stroller. 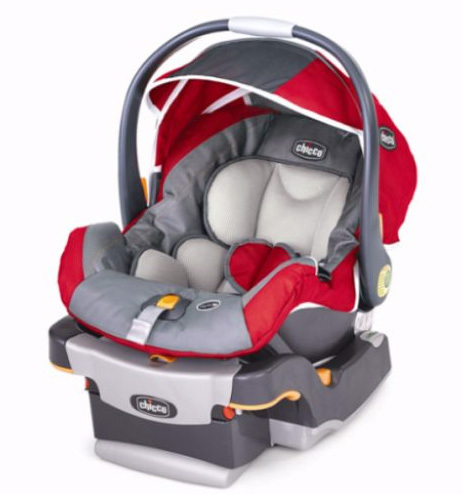 Modern car seat from Chicco® available at Sears for $299.99. So while today’s cribs, strollers and car seats are much sturdier and safer than those of the past, and while you can get a modern cribs and strollers for less than the equivalent cost in 1962, most are considerably better quality and more expensive. 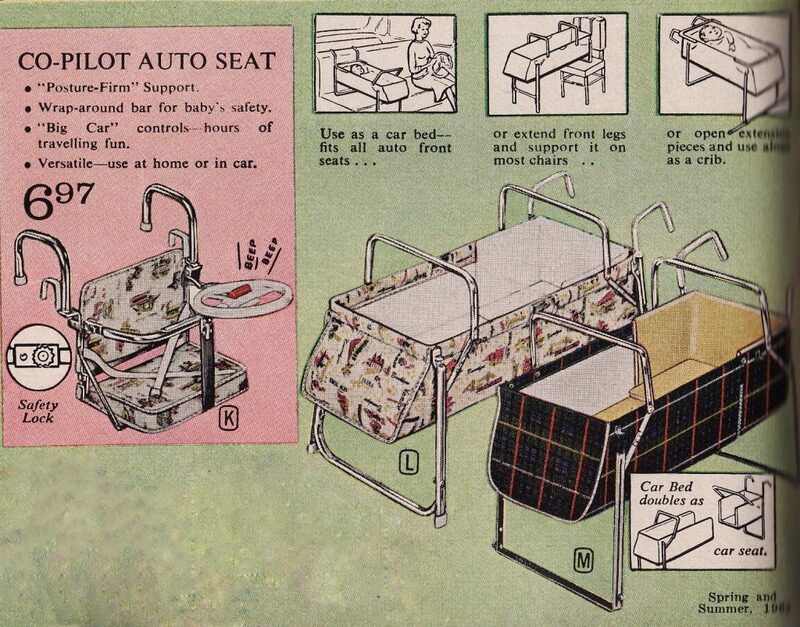 Car seats are all more expensive, but then the 1962 models were a joke. The products shown in today’s post are found on pages 140, 141, 142, and 143 of the Spring and Summer Catalogue.